My review copy: Advanced reader copy provided by the publisher in exchange for an honest review. Apparently "love thy neighbor" changes to "judge thy neighbor" if your family doesn't follow the church playbook. Good friends don't question stalkerish tendencies, and well, Drew's a great friend. This was stupid. Why did I think I could rejoin the team and everything would be okay? Because Brian, a twenty-three-year-old hot guy who knows nothing of my life, thought it would be a good idea? Well, it's not. When God created the Earth, he had such a sick wicked sense of humor. He made everything that's wrong feel really, really good. A charming, intelligent and emotionally rich story, Stealing Parker is even better than Miranda Kenneally's previous novel, Catching Jordan. It's possibly the best thing that happened to fans of YA contemporary romance this year. One incredibly sweet, devilishly hot, sometimes even totally inappropriate (but absolutely delicious) book that is sure to disarm even the toughest and pickiest of readers! Parker used to lead a charmed life. She was one of the best players on the high school softball team, she had friends, popularity, beauty and a perfect family. And everything was going smooth for her, until her mother ran away with another woman and Parker's perfect life crumbled to pieces. Her best friend stabbed her in the back, people stopped talking to her and she became a social pariah, "a butch softball player who probably likes girls". To Parker, it seemed that even God has turned his back on her and her family. Hurt, confused and angry, she quit softball team and lost 20 pounds. To prove that she was not like her mother, she took extra care to look as girly and cute as possible and started hooking up with different boys every night (just kissing, tho!). And then a new hot guy showed up in town and everything quickly spun out of control. Now, the reputation that Parker created for herself and all the bad choices she made along the way are threatening to destroy everything she cares about: her relationship with her father, her friendship with Drew, being the valedictorian, and - most importantly - the love she so desperately needs. In many ways, Stealing Parker is similar to Catching Jordan. Once again we get a group of characters that defy the romantic stereotypes and a lead heroine that is feisty, witty, bold and impossible not to adore. And once again the plot involves sport (in this case, baseball), a complicated love triangle, and a whole lot of sparkly and highly amusing back-and-forth between the characters. 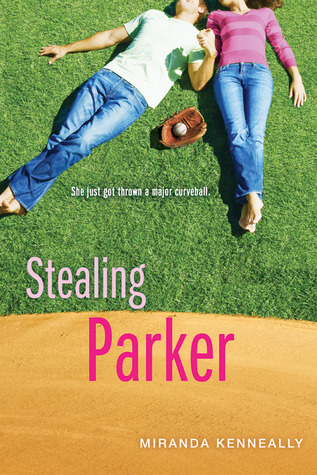 What makes Stealing Parker even more appealing than Catching Jordan is its intensity and maturity. This book touches on some difficult and important areas such as homosexuality, religion and teacher-student relationships. Kenneally wrote a romantic story that is so much more than just that, a novel that explores many themes - from friendship, first love, trust, acceptance, forgiveness to sexuality, bigotry, addiction and rejection. And she did it in the utmost graceful, convincing and emotionally affecting way. I quickly found myself entirely engrossed in the story, in love with the characters, and unable to put the book down. Keneally's writing style is right up my alley. Her prose is honest, very natural and fresh. It's infused with real emotions. At times you feel like a puppet and Miranda Kenneally is the puppet master - she'll make you laugh out loud and clap in excitement and then merely 2 pages later you'll be tearing up and sobbing quietly. And she'll also make you think about all the issues she brings to life in her book. Reading Stealing Parker is an all-around wonderful experience. There's not a single person I wouldn't recommend this book to. And one last thing I just have to mention: Corndog (Will) is so adorable! I loved the chemistry between all the characters - it was charged and intense - but I definitely loved the sweet, tender, shy and innocent chemistry between Corndog and Parker the most! And I couldn't stop laughing each time Parker's dad would mess up Corndog's nickname and change it to Corn Fritter! Don't hesitate to pick this book up. It's an incredibly well-written, beautiful story that balances romance, drama and comedy perfectly. As part of the Home Run blog tour organized by the wonderful folk at Sourcebooks Fire, I get to share with you today this incredibly interesting guest post by Miranda Kenneally! Peanut Gallery: Where does Miranda get her inspiration? Find out as Miranda speaks about her idea origins. As a bonus, Miranda shares the best advice that she ever got about being a writer. Geez, this is a pretty hard question. I get my inspiration from all over the place. From conversations I have with friends and people at work. From inside jokes with my husband. I read lots of books, and see how my favorite authors write plot arcs and characterization, and then I set out to do that too, but with my own edge. I often look through my junior and high school yearbooks to remind myself of how I felt when I was younger. I also like to read my old diaries. One time I got a book idea from a true fact under a Snapple lid. Another time I got a book idea because somebody had broken into my car! I got the idea for the “Jerry Rice fake baby home ec” project in Catching Jordan because I remembered this time I was out on the football field in junior high, and a football player was pushing another player around in a stroller. The best advice I ever got as a writer? - An editor told me my strongest skill as an author is writing groups of teens goofing off and talking about nothing, so now I try to have my characters bantering while doing lots of wild and wacky things while trying to move the plot forward. And I have a great time doing it! I try to write silly scenes that I hope people will enjoy reading. As part of the blog tour, Sourcebooks Fire has generously offered to give away a finished copy of Stealing Parker to one lucky US reader! Please enter via Rafflecopter below! I'm really looking forward to reading this one. I've heard so many good things about it! I finally read Catching Jordan after reading a TON of reviews that were all positive. And I am so very glad that I did. I loved every single page. When I heard about Stealing Parker, I knew I had to read it. After reading your (fabulous) review, I gotta get my hands on this book. If I love it half as much as Catching Jordan, it will be right up there as a favorite! Thanks so much for the giveaway! just one more word: awesome! Poor Parker. I just have to see how she makes it through this bad situation. I heard great things about this book although I haven't read Catching Jordan yet. I love that the book has touched different themes delicately. Thanks for the review! I really need to read this book. I still need to read Catching Jordan too. I have that scheduled in for myself in December. They sound like books I would love so I am making time for them. Thanks for the great review and guest post! This sounds like just my kind of book. Thanks for the review and giveaway! I've been looking for a good contemporary read lately and I think I've found it. Can't wait to read this one! Awesome review! I think I loved this book more than Catching Jordan.. It is one of my new favorites and I can't wait to read more from Miranda! I enjoy characters that defy stereotypes, especially when they're like-able and funny in the process. Stealing Parker sounds like one I'm definitely going to have to pick up. This just sounds really good! It sounds humorous and like I'll really like Parker. I can't wait to read it! I've heard so many good things about both Catching Jordan and Stealing Parker, but I can honestly say this is the best review of Stealing Parker I've read yet. I like how your review showed Stealing Parker as this really amazing read just in general, but also picks out heavy topics on the side. Do want! Gosh, now I want to read it just so I can learn the context for those quotes. one of my friend also gave a god review for this book. Probably I'll try to read this book.